This converts to 2-3% everyday. Now for the time being forget stock markets. Think about any business that makes 2-3% everyday or a 100% return every quarter? Does any business comes to your mind? No, Nada, Nothing. There is no business that can generate that kind of returns. If there was some business like that – all other businesses would simply not exist. However making 2-3% per month from trading options is possible if not more. This in my view is significant if you can compound accumulated profits month after month to make more money. The idea is not to withdraw profits and re-invest the profits back in to trading conservatively and keep making profits. In my options trading course I teach conservative strategies that can help you make 2-3% a month from trading. Click here to read more about the course. This is an impossible dream which traders love to dream. They day dream something like this – “If I can make Rs. 2000 from one lakh everyday, I can invest 10 lakhs and make Rs. 20,000/- everyday which is more than 4 lakhs a month. Enough for a comfortable living”. Their day-dreaming does not end there. They then dream of pulling crores from friends and relatives even from banks and make crores every year. Hell they do not even know why they need so much money in the first place. 🙂 But dream they do. Sadly this dream costs them dearly. How? You see all stock market advisory companies, Intraday tip providers, options & futures tip providing companies and others in similar business know this very well and are able to sell these people their dreams. Hell even I am a victim. I wasted Rs.40,000 paying money to various tip providers and lost close to Rs.60,000 trading their tips. Thanks to them I turned to books, but that’s a different story. But fact is its very easy to sell a dream. Just Google “Intraday tips” or “stock tips” or “option tips” and see the results page. You will see dreams being sold. Advertisements like “over 10% monthly returns”, “100% Percent Returns”, “50K to 2 Lakhs”, “Over 1000% Returns”, “100% secure tips”, “Make Rs.5000 Daily”, “100% Accurate Analysis” and lots more will pop up. Tell me now, do you think its possible? If no then why do you buy such dreams? Let me tell you in a very blunt language – making money is hard – you cannot make it rich by getting tips from someone. You have to walk your own path, that’s why God has given you brains. If making Rs. 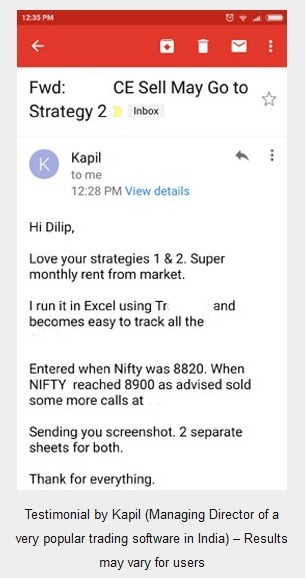 2000/- daily is possible just by paying someone 2-3k a month and 1 lakh/50000 in trading account then why do people study in costly schools and colleges? Hell borrow 1 lakh from your parents, open a trading account, and pay a tip provider 2k a month and laugh your way to banks. Life ain’t that easy. Is that even remotely possible? In fact Thank God its not possible else the world would had collapsed. No one would work. All would wait for that next tip to get rich. It would be a strange world. You Mean Intraday Trading Does Not Work? No, I never said that. I only said if you are thinking tips providers will make you money giving Intraday tips then that will NOT work. You can of course work hard and become an expert day trader. There are many books written on them, you can do online research or try your own strategies to try your hand at day trading. But its only you who can help you to become an expert Intraday trader. No one else can. When I was losing money I tried several Intraday strategies on my own. Most of it is not worth sharing but there is one that I feel may work if you try which I will reveal shortly. Ok. But I tried a lot of strategies. I will tell you something that may work Intraday, but you will have to practice to perfect it. Note: What you will read below needs a lot of patience and practice. However there is an easier way to trade Intraday trading not written here. If interested to know please please contact me. In other words a trader takes lots of trades (mostly done in equity cash because of high liquidity – but it can be done in Nifty Options as well) and will try to make small profits in most of the trades. Of course the profit in terms of cash should be double that of loss. So one profitable trade means the trader can take two more trades. 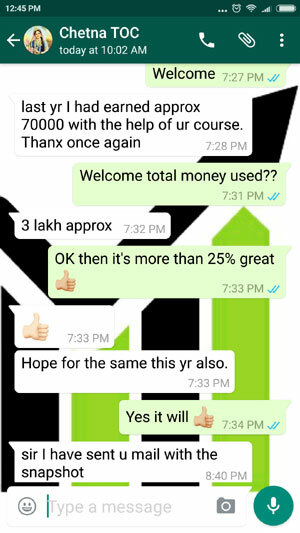 Like this if the trader takes 10 trades in a day and has a success rate of even 50% – he can make Rs.2000 to Rs.3000 daily from a small account. Scalping is an art. Whether you know technical analysis or not is not important. Lots of practice, planning and patience is required to be a successful scalper. Also its a full time job. You cannot become a successful day trader with another full time job. Day trading needs your time and attention. Not monitoring your trades or leaving your monitor without stop loss in system can be disastrous. To reduce stress, especially in western countries, there are many automated trading systems that are based on the scalping methods. Since its automated hundreds of trades can be taken in a day. And they can book profits in tenth of a second. You got the idea of how fast it can be if automated. Of course automating trading is a costly affair. So here is how you can do scalping. Which Stocks To Trade in Scalping and How To Trade It Intraday? Highly liquid stocks. Here is something I tried but could not take it further as I lost interest in Scalping due to the stress. Disclaimer: Please note that this is an advice. Please do your own research before doing real trading. Stock market investment is risky. Please paper trade before committing real money. Then I used to open graph of top 3 gainers and losers. The idea was to pick stocks with clear trend and with high liquidity. (See there is NO technical knowledge required but BOTH my objectives are met when I am doing this. One I am trading in highly liquid stocks and two I can see the trend at least for the day). Also remember the idea was to scalp – so even a small profit would do. Of course I used to trade in only 1 stock at any given time. After 2 pm I did not trade. Ok as you can see around 11-11.30 am Hindustan Unilever Ltd. is showing a clear trend. 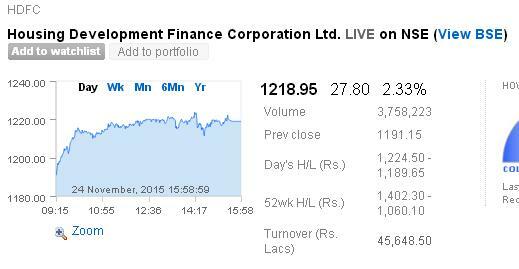 HDFC not. 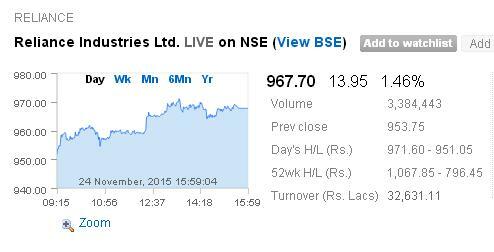 Reliance Industries Ltd no. Bosch Ltd. yes. 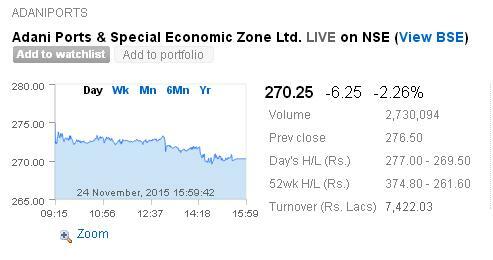 Adani Ports yes. 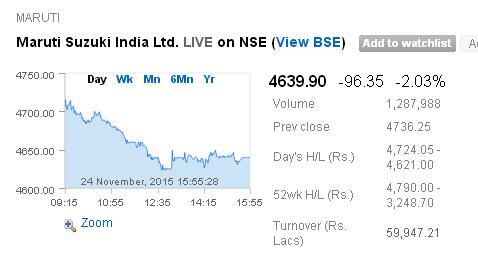 Maruti Suzuki India Ltd. Yes. Next I used to go to http://www.moneycontrol.com/ to read any news on the stocks showing clear trend to know why they are gaining or losing most. In the above case Hindustan Unilever Ltd., Bosch Ltd., Adani Ports, & Maruti Suzuki India Ltd. According to news I used to pick my stock. News like being acquired by someone, or corruption charges on management, quarterly results etc have big impact at least on that day of trading. Based on how strong the news is a stock was picked. Of course its easy to understand that I used to go with the trend. For example if the news says Hindustan Unilever Ltd. profits more than expected then there is a strong possibility that the stock will not reverse direction. 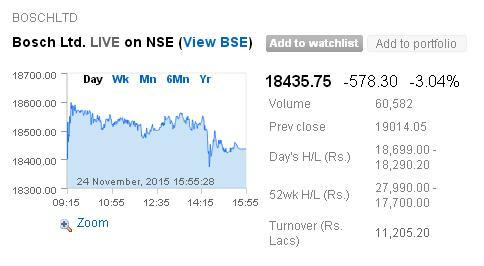 Or news like Maruti Suzuki sales dropped means at least for day the stock will have more sellers than buyers. You see in this trade your real threat is a whipsaw (stock reversing direction). What Was My Profit or Loss Target? Well my account was really small after losses. I did not want to risk too much and I was in the experiment mode, so in terms of money it was very small. 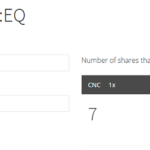 In terms of percentage you can try initially with 0.5% of profits and 0.25% loss on margin blocked. This has to be maintained. Of course you can do 1% profits and 0.5% losses, choice is yours, but to succeed you must make double your losses. And both stop losses should be in system. Of course if a trade is making profit you can keep increasing stop loss (called trailing stop loss)to take out the maximum profits for the day. But again that needs to be practiced. Its an art. If you can practice and perfect the above you can become a good scalper and Intraday trader. Start with a small account. Risk only Rs.3000-5000 initially. See if you are profitable doing this in 20 days of trading. If you are, double your risk or increase it Rs.10000. That way you will gain some experience and of course confidence of risking more money. 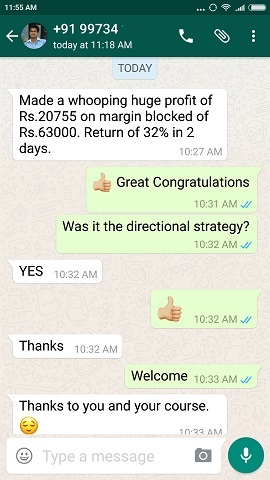 If you straight away start with 1 lakh and lose 10% of it in 20 days of trading then you will not have the confidence of trading more. So start small. Once you become successful and have proved yourself, take multiple trades a day. Remember its more about controlling your emotions than that stock’s movement itself. When a lot is at stake we tend to behave very abnormally – so you need to learn to control your emotions to become a successful Intraday or day trader and scale your profits. This can only come by practicing and hard work. You cannot buy hard work, can you? Its not easy to make Rs.2000 or Rs.3000 daily day or Intraday trading. Tips providers are certainly not going to make you rich. Please stop wasting your money on them. Learn the art of scalping. It is the art of buying liquid stocks in cash on Intraday basis and selling them at a profit as soon as possible. Once you are good at it scale it with more trades in a day and more money in your trading account. NOTE: The above trading strategy can be done in an easy way which is not written here. If interested to learn from me please contact me. Ramesh I deleted your mobile number to protect your privacy as this page is in open domain and can be seen by anyone. Please learn as much as possible on stock markets it will help. Only knowledge can take you forward in life no one else can. 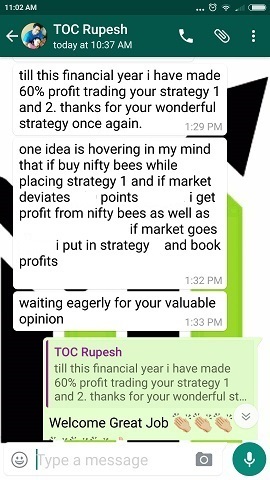 I have been practicing Strategy 1 for quite a some time now and able to profit and adjust spreads intelligently as per your guidelines. Hope to see you similar articles in future. You really open eyes of lots of people who consistently lose money in this mirage of trading. I read your email and noted the contents. you are genuine, honest, and perfect. each and every sentence is correct and true. Realy it is great article and good insight for day traders .You are fantastic. You are abs right dilip ji.. Its like when they show stunts on TV they put line below in small font of dont try this at home .. Same applies to day trading .. Try & learn first & also kill the greed..
Also this is not for someone who possess faint heart . One last point would like to add is if anyone willing to try intra cash then MUST use bracket order. Thanks for the bracket order reminder. A bracket order is a stop order for (both the profits and loss) which gets executed as soon as the order goes live. Effectively the trader now need not watch the position. As soon as one stop order gets executed – the other stop order gets cancelled. Some brokers also allow automated trailing stop orders. Which means if the stock moving in correct direction the stop loss order gets cancelled and only the stop order for taking profits keeps changing. The percentage needs to be decided by the trader though. If you are saying thanks twice for a small point then we have to this for all the stuff you did ..
An eye opener for the aspiring / novice / most of the experienced day (dreamers ? ) traders. ‘ Effectively for the trader no need to watch the position. ‘. Am i right or misunderstood the line. Sir corrected. Yes you understood it correctly. Thanks for letting me know it was typed wrongly. Very nice and clear advice just like a parents or teacher. Thanks . Thanks Kamalendu. Glad you learned something out of it. Thanks Ashim. Keep reading the blog for more information.